Ken Onion makes all his custom knives from his home in Ahuimanu. Onion grinds a blade. Ken Onion's custom knives have a reputation for both artistic quality and utilitarian design. Like everything from jumbo jets to drinking straws, each design starts out as pencil on paper. Onion has file cabinets full of knife sketches, sometimes just the blade, otherwise it might be an inlay design for the handle. To Onion, let's say, knives are both serious business and objects of artistic beauty, and into both he throws every ounce of craftsmanship and quality he can muster. He's a knife maker who studies Fibonacci formulae, the Golden Mean, Divine Proportion and other design philosophies, and yet is most inspired by staring out his window onto the wild tangle of nature -- which begins about 20 feet from his garage door. 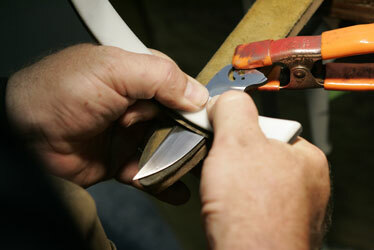 Onion hand polishes a blade, above, then couples it with a handle. 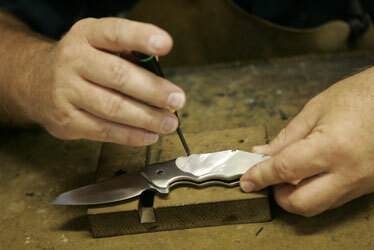 "All custom knives are one-offs, each one a little different," said Onion. The sketch is scanned into a computer -- Onion's screen saver, by the way, is a picture of a pickup truck -- and a vector drawing made of the design. High-tensile steel blocks are cut out to this design by an enormous CNC milling machine. The milled pieces are held together by off-the-shelf drill bits while Onion does the grinding and polishing of the blade and the delicate inlay work on the handle. "The patterns ... could be inspired by a whale, the way it moves through the water," said Onion. "Or even just a leaf blowing into the garage, the way it casts a shadow. All of my designs are pretty organic." Onion engraved a titanium knife with skulls and fire. 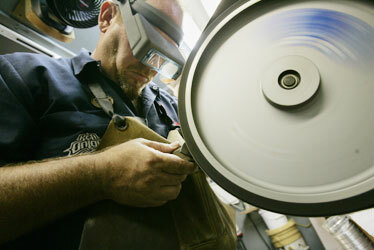 Although the outline is cut by machine, the shaping and sharpening are all done by hand. The blade, the operating mechanisms and the inlay handle are eventually combined into a knife that feels right in the hand, is beautiful to look at -- and also holds an edge. If you really want to get Onion talking, get him going on alloys and molecular bonding and the cutting-edge work being done by German and Japanese metallurgists. The inlay is done with a variety of materials, ranging from different shades of steel and titanium to woolly mammoth bone to opals. Onion raises his eyebrows. "That's a little ... loud, isn't it?"